Sat., 16 Nov. - Sun., 8 Dec.
Fri., 22 Nov. - Fri., 6 Dec. Mon., 3 Jun. - Mon., 24 Jun. Tue., 30 Apr. - Mon., 24 Jun. Mon., 1 Jul. - Mon., 2 Sep. Mon., 3 Jun. - Sat., 22 Jun. 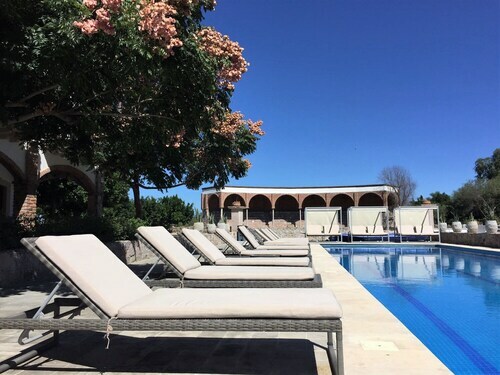 Situated in Silao, this hotel is within 6 mi (10 km) of Victoria Garden, Church of Loreto, and Gonzalez Obregon Market. Church of Santiago Apostol and Silao Main Square are also within 6 mi (10 km). 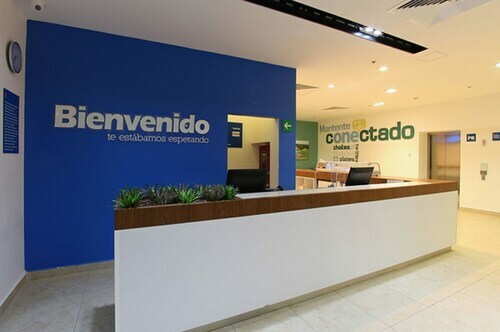 Situated near the airport, in Silao, this aparthotel is in the same region as Altacia Shopping Center. 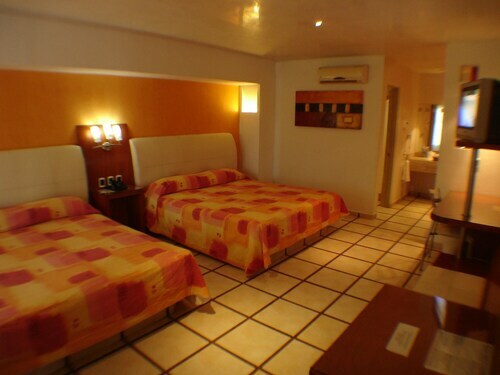 Situated near the airport, this hotel is 7 mi (11.3 km) from Silao Main Square and 8.4 mi (13.6 km) from Leon Raceway. Monument to Christ the King is 17.2 mi (27.7 km) away. Situated in Silao, this hotel is within 12 mi (20 km) of Leon Autodrome, Leon Raceway, and Gonzalez Obregon Market. Victoria Garden and Church of Loreto are also within 16 mi (25 km). Situated near the airport, this eco-friendly hotel is within 3 mi (5 km) of Victoria Garden, Gonzalez Obregon Market, and Silao Main Square. Church of Santiago Apostol and Church of Loreto are also within 3 mi (5 km). 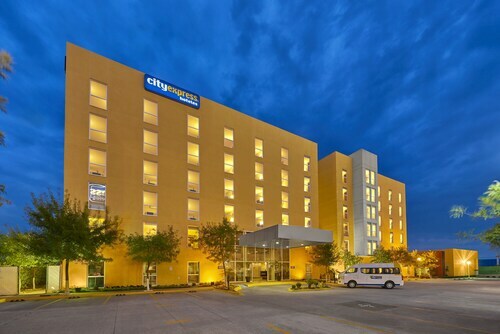 Situated in Silao, this hotel is within 9 mi (15 km) of Victoria Garden, Church of Loreto, and Gonzalez Obregon Market. Church of Santiago Apostol and Silao Main Square are also within 9 mi (15 km). Situated in Silao, this aparthotel is within 9 mi (15 km) of Leon Autodrome, Leon Raceway, and Victoria Garden. Church of Loreto and Gonzalez Obregon Market are also within 12 mi (20 km). Situated in Silao, this eco-friendly hotel is close to Gonzalez Obregon Market, Silao Main Square, and Victoria Garden. Also nearby are Church of Santiago Apostol and Church of Loreto. Question : What is the cheapest date to fly to Leon? Answer : Tickets are presently being sold for $464, 18% below the average price for this route. As of Apr 15th, the cheapest day to fly from Montreal to Leon is May 12th. Question : How much time do people spend in Leon? Answer : The average time spent in Leon by passengers from Montreal is 17 days. Answer : The cheapest day to fly from Montreal to Leon is on Saturday. So, if you would like to save some money on your next trip look for flights on that day. Answer : Yes, you can switch your departure or arrival date. If you want to save a little money in doing so, the cheapest day to fly in April is Saturday. Question : What is the cheapest airline flying from Montreal to Leon? Answer : Delta Air Lines is offering the best deal at $464. Better look quickly because prices range all the way up to $771 over the next three months. Question : How much is a plane ticket to Leon (BJX) from Montreal (YUL)? Answer : They can vary from $464 to $771. Booking in advance can typically help you get the cheapest ticket. However, usually the sooner you book, the better price you get.